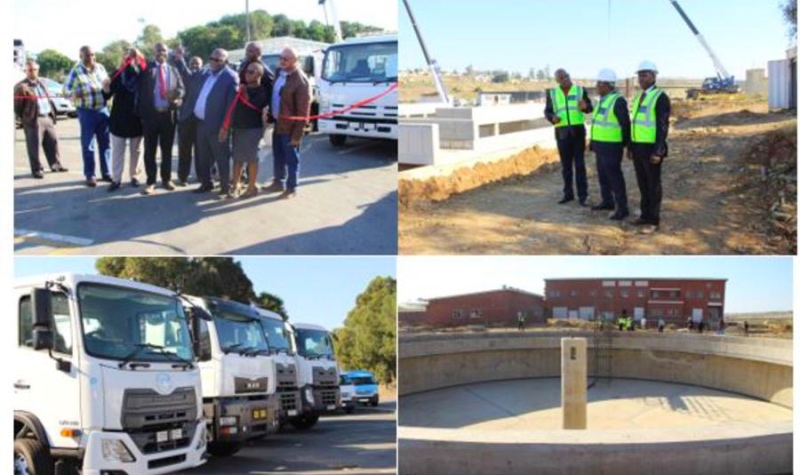 On Wednesday 13 June, the Executive Mayor Xola Pakati unveiled a R54 million new fleet at the King William’s Town War Memorial Hall. The fleet includes 20 new compactor trucks, eight tipper trucks, water tankers, and three TLB’s. The municipality has been faced with a challenge of an ailing and inadequate fleet of refuse trucks to service the whole Metro. Previously the Metro had only eight refuse trucks to service the entire Metro, due to the intensive work and large area covered, the truck’s condition had severely deteriorated. Representatives from Isuzu and Volkswagen which the Metro has contracts with, were there to ceremoniously hand over keys of the fleet to the mayor. BCMM’s Infrastructure Services also conducted site visits to projects in the inland region of the Metro. Site visits were made to the new King Williams Town electricity sub-station, Cliff rural roads project, and the Phakamisa Waste Water Treatment Works (WWTW). A contractor has been appointed to resurface roads in the Cliff area of Phakamisa in Ward 25. The project worth R4 million has employed 14 labourers from the community and is expected to be completed in August. One of the Metro’s Major projects is the Phakamisa WWTW, which in its completion service Bhisho, King William’s Town (KWT) and Zwelitsha urban and peri-urban areas. This is a multi-year project worth R249 million and is expected to be operational by April 2019. In closing Pakati said that upgrading of infrastructure and the procurement of the new fleet will provide the municipality with the capacity to deliver services to the people with minimum outside intervention.